Another player has joined the ranks of the (painted) Ravens: Ludwig Wightenstein. Ready to beat down opponents not only by reducing philosophical problems to linguistic puzzles, but also with his mechanical claw of nasty death. Ludwig is an all-plastic conversion composed of several bits and pieces. The torso and pauldron are from GW’s Empire knights set, while the head, left arm and legs are from their classic (80s-90s) plastic skeleton set. The right arm is from GW’s zombie set, and the right wrist with the claw comes from Mantic’s ghoul sprue. I also greenstuffed tattered remains of clothing around his waist to mask the join between the legs and the torso. 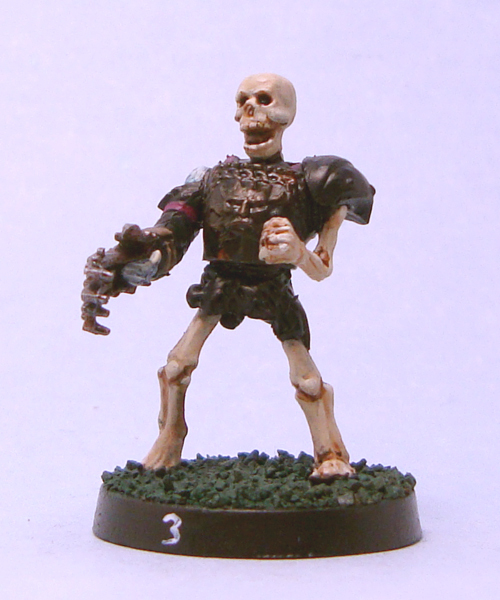 Wightenstein’s right arm still bears old, undead flesh – no doubt kept in its state by some vile magic in the claw. He was given a quick, simple paint job. I went for a rusty, old armour look. The clothing (or rather lack of it) posed a problem, but I tried to convey the black and purple uniform of the Ravens nevertheless. I’m fairly happy with the model, but less so with my progress with the team. The league is scheduled to kick off soon, and I’d love to field a fully painted team for once.